The last time I met a group of strangers in a layby it was 1989, the second Summer of Love. Under-age and under dressed, we were trying to find a field with a rave in it. 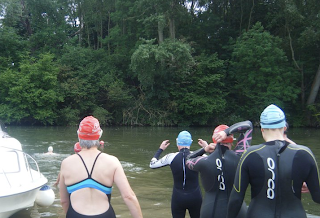 Over 20 years on, I'm doing something a little more age-appropriate but just as fun: meeting outdoor swimmers, pulling on a swimsuit and jumping in a river. After making friends in a heartbeat – standing semi-naked by the side of a B-road does accelerate the bonding process – we pick our way across a field. We're quite a sight: barefoot, red hats, wet suits and goggles. Chat is excited but a little nervous. How long will the swim take? How cold will the water be? Will the current help us? What happens if we want to get out early? We pass a group of picnickers, flushed pink from the sun and the empty bottles of wine littering their rug. They wave and shout words of encouragement. Soon we're at the riverbank. Here in Oxfordshire, we are around 40 miles from the source of London's great river. The water is brown-green, clean and sleepily slow-moving, the bank lined with lush shrubbery. I hop down and into the shallows, surprised to feel sand between my toes. The water is colder than I expected but as soon as I dive under and stretch out, my shivers pass and it cools me down. I am at the front (it won't last), cleaving through the water at a gentle pace. 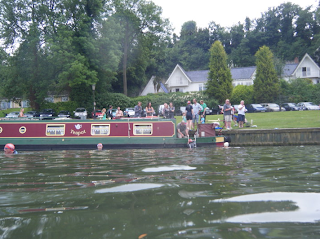 No-one is racing: strokes are languid as we drink in the surroundings. It's exceptionally peaceful, just the lapping of the water, murmuring chat and the occasional whoop behind us as someone enters the water. Reeds and leaves become entangled in my fingers. Ducklings wobble past. And every five minutes a large boat looms into view. It makes me feel very small bobbing at water level as they cruise past. After a kilometre or so, I'm starting to chill. Most people are in sturdy wetsuits but my new-found friend and I are in skimpy swimsuits (it was only a last minute change of heart that made me leave my bikini at home). So we get out at a stretch of sand and walk back to the parked cars. Our goose bumps are soon warmed by the afternoon sun. 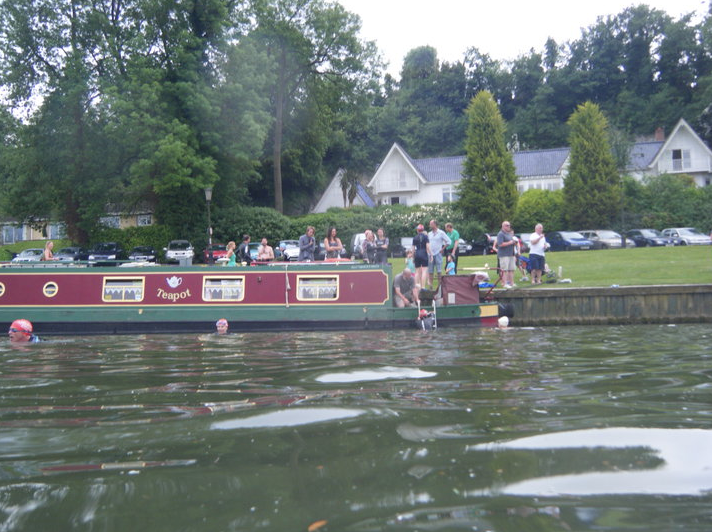 We catch a lift to the end of the swim, at the village of Shillingford a mile away, and await the swimmers (pictured, above – that's me by the barge wrapped in a woolly grey cardigan). Soon, red hats appear around a bend in the river. 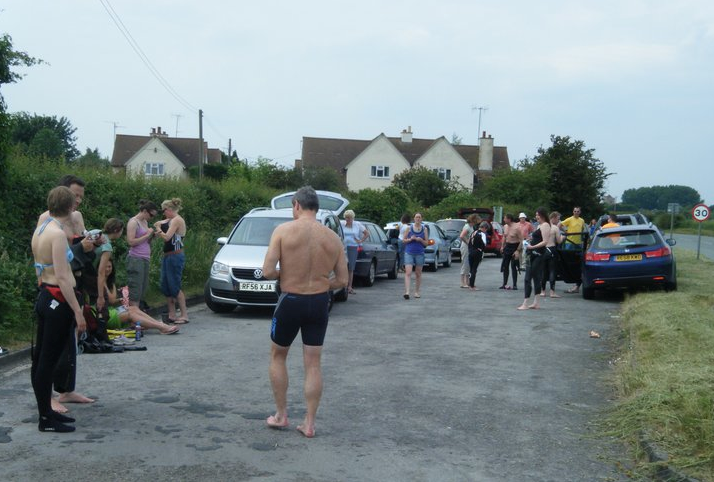 They reach the bank and clamber out into awaiting towels, beaming with the joy of exertion, relief and pride. I haven't enjoyed a Saturday afternoon this much in years.